Louise graduated from Glasgow Vet School in 2002. 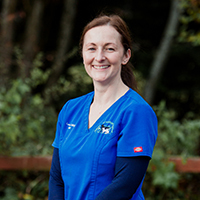 Since then Louise has worked in both mixed and equine practice in the Midlands and in the Highlands before joining Inshes Vets in April 2014. Louise loves keeping active in her spare time and enjoys walking her 3 dogs, Stella the Staffie and two terriers Betty and Marni.